THE prospects of finding life elsewhere in the universe have been boosted massively after the publication of a “hugely surprising” new study suggesting that swathes of planets outside our solar system contain vast amounts of water. Scientists led by Harvard University’s Dr Li Zeng found that many of the planets identified by Nasa’s Kepler Space Telescope and the European Space Agency’s Gaia mission may contain as much as 50 percent water. The news comes weeks after the discovery of a large lake of water on Mars, which prompted NASA’s Dr Vladimir Airapetian to tell Express.co.uk life could be identified on the Red Planet within three years. Dr Zeng’s study, which was presented at the Goldschmidt conference in Boston, concluded that the mass of many exoplanets which are between two and four times the size of Earth can be explained by large amounts of water. If his findings are correct, it significantly increases the chances of life on other planets, given that water has been instrumental to the development of life on our own. Since the discovery of the first exoplanet in 1992, scientists have concluded that many of the 4,000 confirmed or candidate exoplanets discovered so far fall can be divided into two categories: those with the planetary radius averaging around 1.5 that of the Earth, and those averaging around 2.5 times the radius of the Earth. Unveiled his exciting research, Dr Zeng pointed to findings which suggested the proportion of water on many exoplanets appeared to dwarf that of the Earth, where it makes up just 0.02 percent of the mass of the planet. He and his colleagues analysed exoplanets with mass and radius measurements from the Gaia satellite in order to develop a model of their internal structure. This indicates that exoplanets which have a radius of about 1.5 times the size of the Earth, which are five times the mass of our own, tend to be rocky planets, while those with a radius 2.5 times the size of Earth, and 10 times the mass, are likely to be water worlds. Dr Zeng added: “This is water, but not as commonly found here on Earth. “Their surface temperature is expected to be in the 200 to 500 degree Celsius range. Their surface may be shrouded in a water-vapor-dominated atmosphere, with a liquid water layer underneath. “Moving deeper, one would expect to find this water transforms into high-pressure ices before we reaching the solid rocky core. 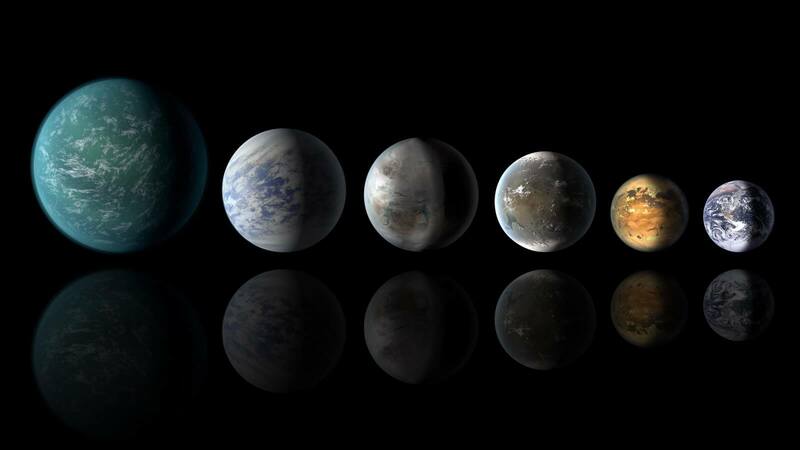 The study suggests that about 35 percent of all known exoplanets bigger than Earth should be water-rich. Such water worlds are likely to have formed in a similar way to the giant planets cores (Jupiter, Saturn, Uranus, Neptune) which we find in our own solar system. He said:“The newly-launched TESS mission will find many more of them, with the help of ground-based spectroscopic follow-up. The next generation space telescope, the James Webb Space Telescope, will hopefully characterise the atmosphere of some of them. Professor Sara Seager, Professor of Planetary Science at Massachusetts Institute of Technology (MIT), and deputy science director of the recently-launched TESS (Transiting Exoplanet Survey Satellite) mission, said: “It’s amazing to think that the enigmatic intermediate-size exoplanets could be water worlds with vast amounts of water. Earlier this month Dr Airapetian said the discovery of the Mars lake, coupled with a separate study suggesting fluctuations in the levels of methane in its atmosphere which could be caused by biological processes, were “exciting”.